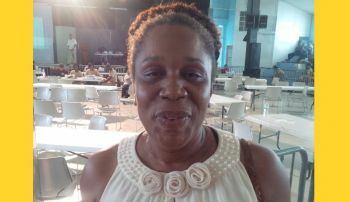 One of three women on the VIP At Large ticket, Rosan-Bunbury said also that this defeat hardly spells the end of her political ambitions as she has already started campaigning for next elections. The first time political aspirant lamented the short time that was available for campaigning and felt more could have been achieved if more time had been available to spread the word. “I respect their choice to be happy to the Government they have. I think we did a wonderful job with the time we had,” the former magistrate said. Asked whether or not she was personally disappointed, she said she does not get personally invested in such undertaking knowing the possibilities. “My motto is hope for the best, get ready for the worst and accept what God sends,” she said. Rosan-Bunbury declared that she plans to always stay relevant. “I will follow up with what is going on in the country [and continue to meet the people]. She said her allegiance to the VIP remains solid. 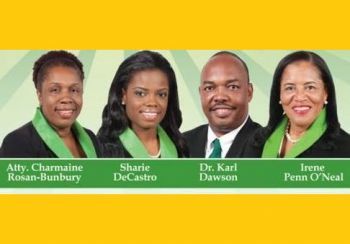 Charmaine Rosan-Bunbury garnered 1,770 votes, Irene F. Penn-O’Neal 2905 votes, Dr Karl Dawson 3,420 votes and Sharie B. de Castro 2,676 votes. During the brief campaign period, Rosan-Bunbury spoke on her plans to ensure that there is justice for public servants, equality and women’s rights and renewable energy and care for the environment. Dead dead team, made no sense. Charmaine you are a courageous soul and gracious person, it is too unfortunate that ****** choose to be a fly in your ointment, she has no shame, she choose to put self before country. she was encourage to return and run with the party, she did not commit because she was hoping that the party would have gotten desperate and offer her leadership, when she realize that she could not get her way, she ran independent to spoil the VIP chance at the polls.She ran a deceptive campaign telling people that she was running as VIP back up and some of her supporters believe her and split their votes. Charmaine I encourage you to keep on trying, stay loyal to the VIP, don't be bought into corruption and crime. If 4 time loser Hubert O'Neal can win V.G and dead dog can win an election and make it to the HOA, don't worry with the NDP haters, when the NDP soup dry up they would come running back to the VIP. That is a message you could tell a 6 year old because they wont know any better....but come on....Charmaine is a grown woman....she knows better.....the voters of her party sent her a clear message.....stay out of the HOA kitchen if you can take the heat. They did not want her there. @@bvi, Please get lost. Rosan-Bunbury was the only one on the VIP ticket who came with solutions and plans. The media was so caught up in sensational headlines that they would not run stories on the issues. She is the best thing on the VIP slate and they know that. They don't have caliber like she. Now take that to the bank and cash it. VIP, please ensure she is on your ballot in 4 years. Peace out! You are clearly in denial LOLOLOL she is already off their ticket!!! Oh sorry maybe you haven't gotten that 411 as yet. "Coming soon....to a school child near you." keep reaching for the stars. nothing wrong with that. Tell 2 times reject OJ Smith, that the people of the 3rd district send him a strong message that they don't want him as their district representative, remind Hubert O'Neal of his 4 time trashing in VG and remind the NDP of their 2007 11 to 2 defeat by the VIP, what goes around comes around. she is a great candiate I do not care what a man say! This women was so negative. All she did was attack the NDP with her hate speeches. We the people are fedup with this. Please note if you return again: please bring solutions to the table not propaganda. its okay for the NDP to attack Mr. Frazer with hate speech, they base their entire campaign on destroying Mr.Frazer character but it is not okay for the VIP to attack the NDP on issues, further more if you did not hear her solutions it showes that your head is pack with too much $h1t to comprehend anything of substance, she is the only candidate that presented solutions throughout the campaign, so to you I say STF up. You party stayed in office for 31/2 years attacking the government, and they started early elections in Dec & Jan. The minister from the first aired polictical ads for weeks on the NDP. But ooooo you all thought they were dealing with the 2007 ndp Bam Bam Bam!!!! Wheel and come again my youth. To you I say pig in pen will always be pig in pen, why put a pig in a house when they are comfortable being in their natural environment? the NDP is doing a very good job and I must compliment them for keeping the pigs in the pen.